The central Asian steppe runs through Kazakhstan, Turkmenistan, Uzbekistan and Mongolia. The environment can be harsh, with dust storms, little to no annual rainfall, and temperatures ranging from -4 to 90 degrees Fahrenheit. Because of these conditions, the steppes are home to a unique array of animals, many found nowhere else in the world. Poaching has taken a severe toll, but two flagship species -- the saiga antelope and the Przewalski horse -- appear to be recovering. Saiga antelope live on the steppes throughout central Asia. They have long, thick noses that resemble probosces. They graze on bushes, grasses and herbs. During the Soviet era, the government protected the saiga antelope, and their numbers remained stable. Between 1990 and 2005, though, poachers killed 94 percent of the population. The International Union for Conservation of Nature has listed the saiga antelope as critically endangered, but with the help of the British government, these unique animals are beginning to make a comeback. 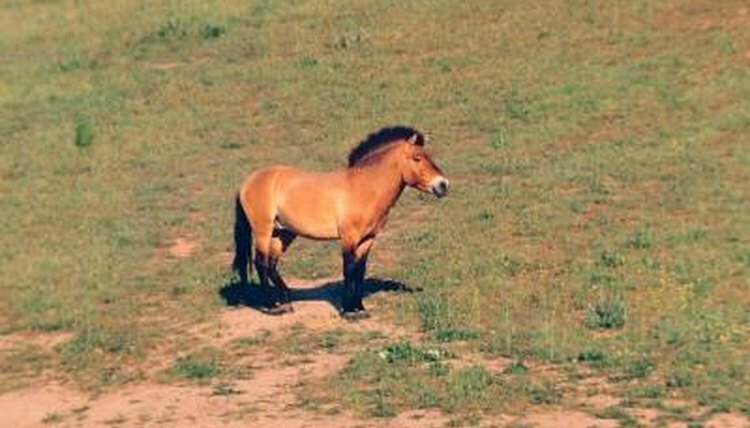 By the late 1960s, the wild Przewalski horse had disappeared from Mongolia’s steppes. These animals originally inhabited the country’s grasslands and arid plains, where they foraged for fruit, grass and other plants and occasionally dined on tree bark and leaves. In 1990, the Mongolian government began reintroducing captive-bred Przewalski horses into Hustai National Park, a 200-square-mile area of steppe set aside for the animals. In addition to the saiga antelope and the Przewalski horse, grazing animals such as the Bactrian camel, the goitered gazelle and the Ustyard urial -- a wild sheep -- live on the steppes. Bobac marmots, a species of large, burrowing rodents, establish underground communities. Foxes and wolves prey on large animals, while the smaller marbled polecats dine mostly on rodents. Many rare and endangered birds inhabit the central Asian grasslands. The flightless Houbara bustards often are hunted for their meat. Sand grouse, demoiselle cranes, white-winged larks and black larks spend their lives on the steppes. Black vultures feed on carrion. About 95 percent of the world’s sociable lapwings, a critically endangered species, is concentrated in Kazakhstan’s steppes. Birds of prey include the lesser kestrel, the saker falcon and the eastern imperial eagle. Saiga Conservation Alliance: What Are Saigas?